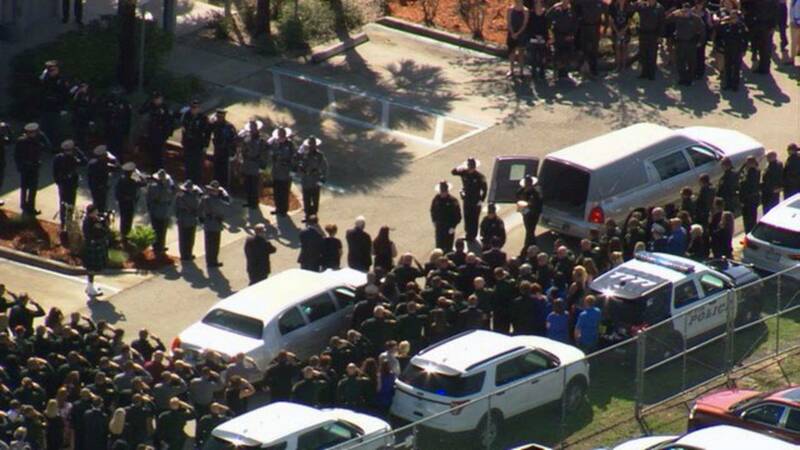 WFTS-TV image of funeral of Highlands County Deputy William Gentry Jr.
SEBRING, Fla. (AP) - A Florida sheriff's deputy who was killed while responding to a dispute over a cat was laid to rest Tuesday -- on Police Memorial Day. Hundreds of deputies, police officers and community members gathered to honor Deputy Willaim Gentry Jr., who was shot in the head in Lake Placid on May 6 and died the following day. "I know we have (the) watch for him on Earth, but he has a watch for us in Heaven," said Lt. Chris Smith with the Highlands County Sheriff's Office. "Though his time of being a field deputy was cut short, it is without question those trained by him will ensure his policing legacy continues on." The 40-year-old deputy joined the force in 2005. He responded to a dispute between neighbors over a cat that had been shot May 6. Officials say Gentry was shot when he approached the front door of 69-year-old Joseph Edward Ables. Ables is charged with first-degree murder.